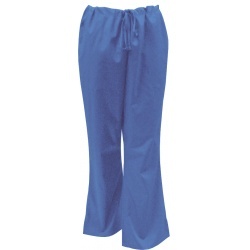 Flat front Flare leg pant /w functional drawstring. Slanted pocket at side, one patch pocket at back. Elastic waist band at back. Side slits / Side vents at bottom leg. Color Options: Black, Ink Blue, Grey, Turquoise, White, Coffee, Wine, Surgical Green, Orchid, Royal.